Twin Blast is the first offering from mobile developer Toolhead Games, released on 1st March 2015 on the Google Play store. The game is a self-described “SHoot eM UP (SHMUP)” in which you control a rather unique weapon system in a bid to destroy various types of enemy before they inevitably destroy you. 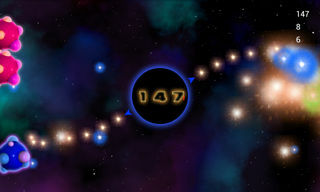 It’s obvious that the game takes inspiration from early space shooter such as Asteroids, they even mention this on their official website, but the game stands apart from other titles, primarily due to its unique control scheme and playstyle. Toolhead apparently decided that having one gun, and the ability to move made games like Asteroids and it’s many flash and mobile clones far too easy, so they’ve deviated from the formula somewhat. Moving? Nope, that’s for cowards. If you could move, you could run from your impending doom. Instead, you have to sit there, in the exact centre of the screen while death assails you from all sides. To make this “fair” the Gods On High (the devs, to you and me) have seen fit to grant you with some additional firepower. Yup, the game named “Twin” blast gives you two guns, who saw that coming? But wait, there’s a catch. Instead of being able to position the second weapon wherever you want/need it, you have to make do with the fact that your weapons are locked either side of your centre area. That doesn’t sound too bad, does it? Especially when I mention that you get three different firing modes, depending on how long you take to charge your shots, but then the real challenge kicks in. The whole thing is controlled using the tilt functions on your device. When I played, using a Samsung Galaxy Numbers phone, the tilt controls worked pretty well, even if I did feel more than a little silly spinning the phone around and swearing every time something got too close on the side of the screen I wasn’t paying attention to. Be warned, you’ll have to get used to weird looks if you feel like playing this in public. This seems to be an issue with the games interaction with the devices tilt sensors. While it is possible to play with the device at an angle, such as holding it in your lap, or when placed on a table, the tilt controls seem to react better when held at a roughly 90o angle to the floor. Unfortunate, at the time of writing there is no option for non-tilt controls, which may put some off the title. When it comes to gameplay, Twin Blast is pure score attack. 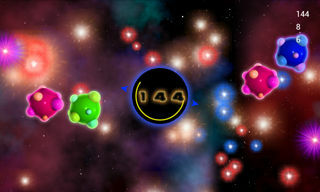 There’s a variety of enemy types in the game, each with its own score bounty, speed and durability, meaning good reflexes are essential to getting anywhere in this game. And there’s an online scoreboard, if you’re the competitive type, that allows you to compare your previous best with players all around the world. Unfortunately, the game does have one major flaw. All the enemies in the game look exactly the same. Now I know it’s an Asteroids-style game, but when you’ve got enemies that behave differently, and take different amounts of firepower to destroy, it’d be nice to have something to tell them apart by beyond their colour. This wouldn’t be a real problem normally, but the game is incredibly vibrant, with lots of different colours present on the screen at any one time. This can lead to confusion, and having to second guess what shot to use in a reflex based game can cost you. Trust me, I’ve died more than once because I’ve fired a ‘rapid’ shot at an enemy, only to find it’s one of the tougher varieties and have it proceed to blow me to bits. It’s also worth noting that this game does not have a colour-blind option, making the already difficult game potentially impossible for colour-blind people. Despite this however, the game is a lot of fun, if rather frustrating at times. Graphically, for a mobile title it looks great (issues with enemy colour aside), and the soundtrack is very good throughout. Sometimes you just need to sit for a bit and shoot things, and when it comes to gratuitous explosions, this game could well have been produced by Michael Bay. And that’s –before- you access the powerups… If you’re looking for a game to relieve stress, or pass time at work I’d definitely recommend at least trying it, and if you’re like me and find it easy to get addicted to this kind of score attack experience, you’ll be playing it for hours. Also, did I mention it insults you when you die?